NEW DELHI: Military officers are up in arms against the government's decision to implement the recommendations of the 7th Central Pay Commission (CPC) on disability pension and are not buying the claim that the compensation package has increased. How justified are their demands? 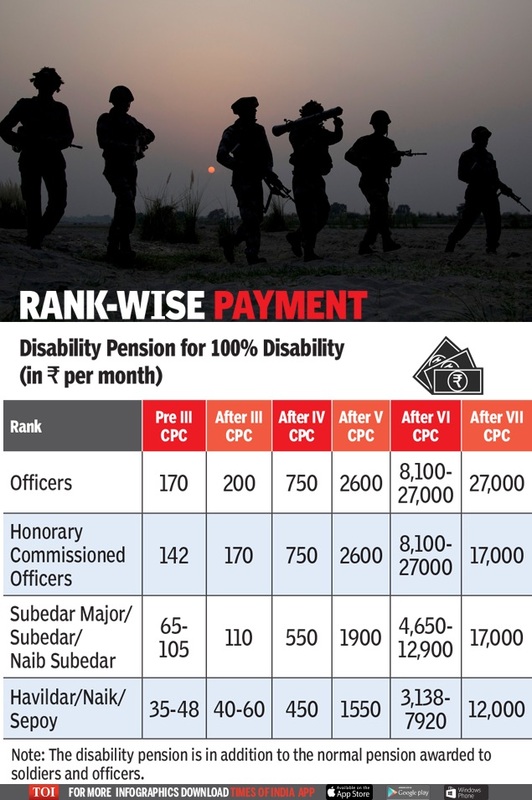 The government's decision to discard the 6th CPC's percentage-based determination - 30% of last drawn basic pay for 100% disability - with a slab-based one in the 7th CPC is intended to bring more equity among different ranks risking their lives in battlefield operations. 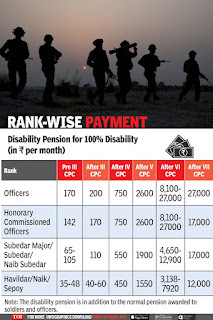 After the 6th CPC, when percentage-based calculation was introduced, for 100% disability at the lowest rank for jawans, the disability pension went up from Rs 1,550 to Rs 3,138, while at the highest level for officers, it rose from Rs 2,600 to Rs 27,000, more than 10 times. increased from 13% in 2007-08 to 20% in 2013-14. 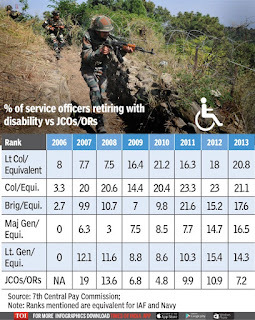 On the other hand, jawans and JCOs retiring with disability decreased from 19% in 2007-08 to 7% in 2013-14. There are 13.2 lakh soldiers and other ranks who stand to lose from this skewed system that seems to benefit 66,700 officers (strength of the three Services). Military officers have been demanding that the government make an upward revision of disability pension from the 6th pay level of 30% of last pay drawn to 50% of last pay in cases of 100% disability. But this would mean a retired general with 100% disability will draw pension equal to the pay of a serving general. A soldier at the bottom of the curve will get an additional Rs 10,000-15,000 per month, besides the normal pension, in case of 100% disability. Disability pension is in addition to normal pension. As per the new slab of the 7th pay panel, officers of the three Services, including honorary commissioned officers, will get Rs 27,000 per month disability pension in addition to normal pension in case of 100% disability. Subedar major, subedar, naib subedar and equivalent ranks in other Services would get Rs 17,000 a month; havildar, naik and sepoy would get Rs 12,000. The equity between the highest paid disability pension to officers and at the lowest rank has been restored to the pre-6th pay panel level. the 5th CPC. But as a consequence of implementation of the percentage-based system in the 6th CPC, the ratio of maximum to minimum was reversed to 8.60. 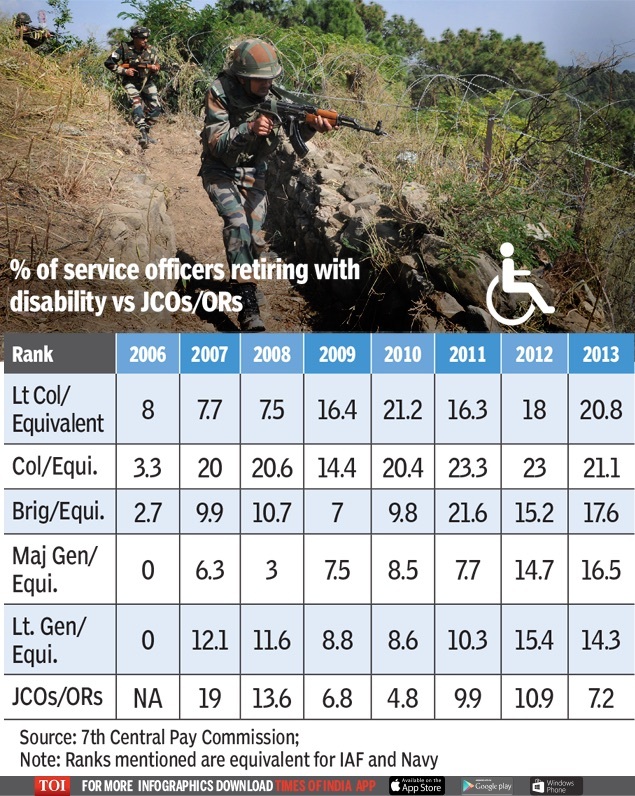 After implementation of the percentage-based disability pension, it was noticed that more senior officers in the rank of brigadier and above were claiming disability and "Service officers invalidated out and one who served on and retired in due course got the same quantum of disability element" in their monthly remuneration package. शरीर की वेलयू(कीमत) सभी की एक बराबर है तो फिर डिसेबिलटी पेंशन में यह इतना बढ़ा अंतर कयों ?? यह सभी जवानों के हयूमन राईटस का उल्लंघन नहीं है ? ? अभी आफीसर की डिसेबिलटी पेंशन कम हुई है तो आफिसरस रो रहे हैं । आफिसरस ने कभी जवानों की डिसेबिलटी पेंशन कम होने की बात कभी सरकार से की थी? ? Utter nonsense without understanding implications. Hamesha officer ke baare main Rona. Kabhi dekha Hain civilian subordinate ko civilian officer ke against is tarah ki baat karte.civilian officer army officer Se jyada beneficiary Hain. agar sharir ki value ek he hai to apne yeh keyu nahi dava kiya ki ek afsar to jayada tankha keyu deti hai governament. Military officers are up in arms against the government's decision to implement the recommendations of the 7th Central Pay Commission (CPC) on disability pension and are not buying the claim that the compensation package has increased.